Dealing with cyber bullying is a major challenge. The expanding use and capabilities of the internet are inevitably leading to conflict between what is considered constitutionally free speech and what needs regulation through legislation. The difference between what a Los Angeles district attorney called “annoying and immature Internet communications” and hate crimes that lead to suicide still must be clearly defined in the courts. Until then, the increase in cyber bullying and high profile cases of suicide among bullied teens is cause for alarm for parents and teachers who need to be informed and proactive when dealing with cyber bullying. A new awareness is urgently needed of the role of popular media, cultural pressures, and self-identity issues among adolescents to recognize the signs of cyber bullying to avoid more tragedies resulting from bullying on or offline. Obviously dealing with cyber bullying has real world consequences and parents need to get involved in their teen’s online lives to protect them from victimization. Cyber bullying includes both internet and cell phone communications and can be any of the following: making fun of another user in an internet chat room, harassing a user on an instant messaging session, and posting derogatory messages on a user’s Facebook or MySpace page. False rumors can be circulated on social networking sites and lewd or unflattering photos of another person can be posted to a personal blog or website. Sending unwanted, threatening or provocative email messages, calling repeatedly another person’s cellphone or sending unsolicited text messages are also forms of anonymous bullying which can harass, coerce, embarrass or humiliate young people online. There have been numerous examples in the United States where cyber bullying has been linked to the suicide of a teenager. The suicide of Megan Meier is an example where the adult perpetrator of the attacks was convicted. Cyber victimization leads to serious consequences with bullied teens suffering from low self-esteem, bullying in response, being scared, frustrated, angry and depressed. Parents need to be aware of their teen’s use of the internet and cellphones and encourage them to talk about malicious calls and messages. Be aware of what sites your child is visiting online and encourage your child’s school to recognize that dealing with cyber bullying is a controllable problem that schools should address as they embrace the use of the internet to engage students and prepare them for achievement in today’s digital society. In August 2008, California’s state legislature passed one of the first bills dealing with cyber bullying and giving school administrators the authority to discipline students for bullying others online or offline. But teens are notably reluctant to report incidents of cyber bullying to an authority figure, mainly because they fear that adults will overreact and cut off online access. They also do not want to reveal themselves as either bullies or targets. Research has shown that getting tough with the bullies themselves often is not an effective intervention, even if the bullies can be identified. Sadly, there are no easy steps to address the problem and promote a culture of peer respect and digital responsibility among teens. It needs a holistic approach to change the school culture to adopt and promote safe, ethical online use. The responsibility of the school then becomes one of including in the curriculum the core character values of responsibility, honesty, fairness and respect for self and others. READ Hey You, Stop that Bullying! Teens need to learn critical thinking skills and decision-making strategies if there is to be real behavioral change. Teachers need to promote a positive climate on campus to reduce online harassment and conflict as students must feel safe in their school environment if they are to thrive. 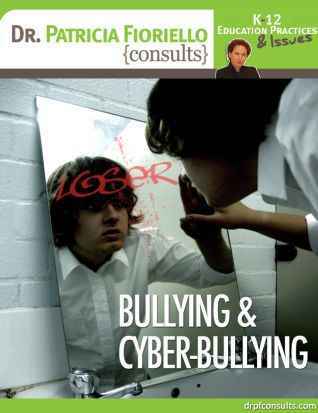 Practical advice and strategies for educators on recognition of the signs of cyber bullying, its prevention and appropriate responses is available online with ebooks such as Dr Patricia Fioriello’s guide on Bullying and Cyber Bullying.